The American Red Cross is providing food, water, shelter, health services and emotional support for approximately 215 people evacuated from their homes because of the Eagle Creek Fire. * Approximately 65 people are seeking refuge at the Red Cross shelter located at Mt. Hood Community College, Yoshida Events Center 26000 SE Stark St, Gresham, OR. The shelter is being operated in partnership with Multnomah County. * Approximately 150 people are seeking refuge at the Red Cross shelter located at the Skamania County Fairgrounds Hedgewald Center, 710 SW Rock Creek Drive, Stevenson, WA. Individuals and families under evacuation orders because of wildfires and in need of shelter assistance are encouraged to simply show up at one of the shelters for help. The Red Cross is working around the clock to provide a comfortable place for evacuees, said Candace Horter, CEO of the American Red Cross Cascades Region. A few days ago, a woman came to our shelter literally shaking from fear. She was evacuated from her home and needed help. Today she is smiling. That's why we do what we do. The local community is coming together to offer aid to people displaced by the Eagle Creek Fire and the relief efforts of the Red Cross. A number of local restaurants have stepped up to offer professionally catered meals at the wildfire evacuation shelters; other companies are offering a portion of proceeds to be donated back to local relief efforts. Additionally, local pro sports teams including the Portland Trail Blazers (NBA), Portland Timbers (MLS), Portland Thorns FC (NWSL), Portland Winterhawks (Western Hockey League) and Hillsboro Hops (Northwest League) are banding together to raise much-needed funds and blood donations to channel through the Red Cross. This is the first joint-philanthropic initiative among the five local professional franchises focusing on a specific cause -- to bring aid to disaster victims. 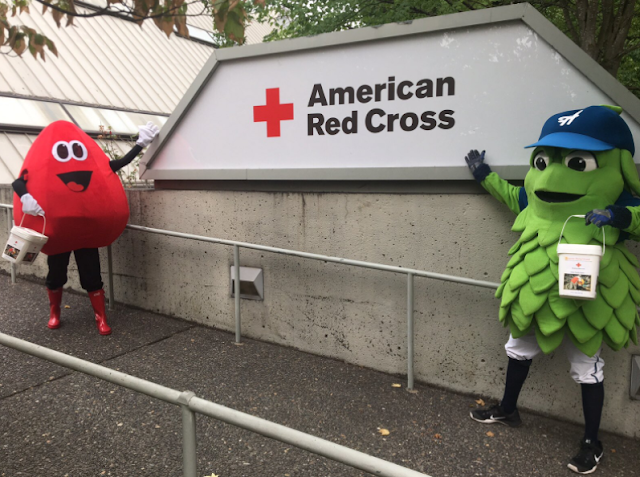 Each professional sports team is hosting a day of support and blood donations at the Red Cross, located at 3131 N. Vancouver Ave. in Portland. The Hillsoboro Hops were on site yesterday, the Portland Timbers and Portland Thorns were on site today. The Portland Winterhawks will be on site tomorrow, Friday, September 8, 7:30 a.m. -- 1:30 p.m. Portland Trail Blazers will be on site on Saturday, September 9 from 8 a.m. -- 2:30 p.m. Donations: People interested in helping Red Cross relief efforts are asked to please make a financial donation to the American Red Cross at redcross.org, by calling 1-800-RED CROSS. You can designate your donation to the Local Red Cross. Call 503-528-5634 to make a financial donation specifically to Oregon Wildfires. Financial donations allow the Red Cross to be flexible in the help we deliver and ensure that we can provide what disaster victims need most during a relief operation.